Hold the book up close and the words appear blurred. Push the book farther away and the words snap back into sharp focus. You may have presbyopia. Finally, a great looking alternative to bifocal spectacles. Even if you have never worn contact lenses, the natural feeling lenses may be an option for you. Whether you're reading, driving or working on a computer, you can enjoy clear vision with AIR OPTIX® AQUA Multifocal contact lenses even if approaching 40 or over. Theyâ€™re designed with TriComfort™ Lens Technology to provide breathability* and moisture retention, while resisting deposit buildup. This lens provides a smooth transition as your eyes move naturally from one distance to another - near, intermediate and far. If you want an alternative to wearing glasses and miss the convenience and ease of contact lenses, make an appointment and ask about a free† one-month†† trial pair of AIR OPTIX® AQUA Multifocal breathable* contact lenses. We'll help determine if they're right for you. 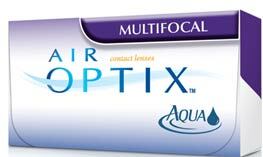 * AIR OPTIX® AQUA Multifocal (lotrafilcon B)contact lenses: High oxygen transmissible lenses. Dk/t = 138 @ -3.00D. Important information for AIR OPTIX® AQUA Multifocal (lotrafilcon B) contact lenses: For daily wear or extended wear up to 6 nights for near/far-sightedness and/or presbyopia. Risk of serious eye problems (i.e., corneal ulcer) is greater for extended wear. In rare cases, loss of vision may result. Side effects like discomfort, mild burning or stinging may occur. †† One-month refers to a recommended replacement schedule of up to four weeks as determined by the eye care practitioner. AIR OPTIX, ALCON, the AIR OPTIX logo and the ALCON logo are trademarks of Novartis AG.